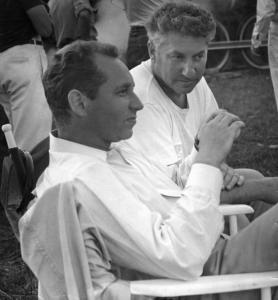 Stuart and Budd Schulberg are renowned figures in television and cinema history — Stuart produced “David Brinkley’s Journal’’ and “Today’’ for NBC in the 1960s and his older brother, Budd, wrote “On the Waterfront’’ and “A Face in the Crowd.’’ But their most enduring legacy might be “Nuremberg,’’ the 1948 documentary commissioned by the United States military about the first war crimes trial of Nazi leaders in 1945, just six months after the end of World War II. Although released in Germany, the film was withheld in the United States for six decades until Sandra Schulberg, Stuart’s daughter, restored it. “Nuremberg: Its Lesson for Today’’ opens Friday at the Kendall Square Cinema with Sandra Schulberg present for question-and-answer sessions on Friday, Saturday, and Sunday. Schulberg first learned of the documentary in 2003 while going through papers in her mother’s apartment. “Nuremberg’’ had never been “lost,’’ she said, as much as it was “actively shelved’’ by the United States government for various political reasons including the advent of the Cold War and skittishness over the images of the Nazi death camps in the documentary. “A 16mm print sat on my father’s shelf near his TV for more than 20 years. But that was useless for restoration,’’ said Schulberg. Eventually she tracked down a 35mm print that had been stored in government archives at a facility in Nebraska. She then embarked on a five-year effort to raise money to restore the original 35mm film. To her great sadness, Budd Schulberg died in August 2009 before restoration of “Nuremberg’’ had been completed. “But he knew that I’d accomplished it and he was very happy,’’ she said. As part of director John Ford’s Washington, D.C.-based Office of Strategic Services Field Photographic Branch/War Crimes Unit, Budd and Stuart Schulberg were dispatched to Europe to compile footage from Nazi propaganda films, newsreels, and private movies that hadn’t been destroyed by the Germans at the end of the war. The assembled footage was used as evidence during the first Nuremberg trial of the top Nazi war criminals. There were later trials of lesser Nazis; “Judgment at Nuremberg,’’ the 1961 feature film, deals with the trial of Nazi judges. The United States War Department, with direct input from Justice Robert H. Jackson, the US prosecutor at Nuremberg, commissioned Stuart Schulberg to complete a documentary about the first trial that attempted to hold accountable some 22 principal architects of Nazi atrocities, including Hermann Göring, Rudolf Hess, and Albert Speer. For Sandra Schulberg, it was essential that the restored film allow audiences to hear the voices of the Nazis as well as Jackson’s famous opening statement that outlined the mission and importance of the historic tribunal. “My vision from the beginning was to use the original soundtrack and narration,’’ said Schulberg. The new narration, spoken by Liev Schreiber, “contains very minor changes’’ from Stuart Schulberg’s original, she said. Since the surviving film had only a German soundtrack, the biggest challenge for the restorers was to create an English soundtrack from courtroom recordings. For that task, Schulberg turned to editor, composer, and filmmaker Josh Waletzky, who directed the acclaimed 1986 documentary “Partisans of Vilna,’’ about the Jewish partisan movement in Lithuania during World War II. Waletzky said the Nuremberg courtroom testimony was originally recorded on cylinders, then transferred to reels. He had to synchronize the sound with visual footage, a painstaking but important process. “The goal from the beginning was to get us as close into that Nuremberg courtroom as possible. It was tricky because the filmmakers recorded everything over the 10-month trial, but filmed only 40 hours,’’ he said. Schulberg and Waletzky wanted to hear the actual voices of the defendants as they delivered their denials and the impassioned words of the US, Soviet, French, and British prosecutors, even if the sound and image were not in sync. “We wanted to preserve the exact intention of the original filmmakers as closely as possible using the audio in the original ‘loose sync’ style,’’ said Waletzky, who also supervised the recording of the film’s original score, re-created by composer John Califra from musical cues made by the film’s original composer, Hans-Otto Borgmann, whose many credits included Nazi propaganda movies.